Creating a particular cardmaking template can help you to make some really stunning cards ... and will be refresher for you when you need to make it again. They will help you to see the required measurements, and it allows you to build up your confidence as you make them. They don't need to be fancy and you don't need to be able to draw either so give it a try ... it will be worth it. Use some of your old card, or scraps, and make all your lines and instructions as bold as you can so that you will see what you need to follow. And then store them safely in your folder to be re-used again and again whenever you need them. This is particularly useful if it has been some time since you did a project, and you need a little refresher on what to do. You can buy templates in many shapes and sizes, and from many different sources and some of them are really spectacular...and complicated...and expensive! But sometimes just a simple idea can be helped along a lot cheaper, and this is the time when making your own can come into play. 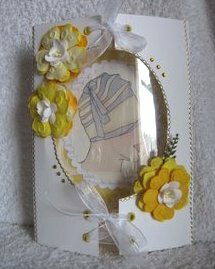 This beautiful Bow front Card has been created using one I made some time ago, and the result is very pretty. Label the ones you create and store them safely in a ring binder and keep them close to hand for whenever you need a new card and you're stuck for ideas. Click the links to take you to more projects that you can make your own templates for. 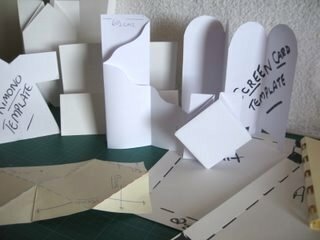 Make your shapes from everyday objects like plates or CD's, square boxes or oblongs.... any thing that you can draw around will create the shape you may need. And Here are the instructions to make a lovely box to fit the Bow Front Card.